Fish oil maximizes the results of your keto diet, but some caution must be taken to avoid selecting a supplement with toxic mercury and heavy metals. With most supplements, a cheap version generally won't harm you while serving up nothing more than a placebo effect. Poor quality fish oil can cause health problems and lack the vital nutrients and benefits derived from quality fish oil. The best fish oil supplements come from pure sources using extraction processes that ensure the nutrients are captured while still fresh. Potency is also a major factor in deciding on a quality fish oil supplement and a high bioavailability is necessary to guarantee that the nutrients are absorbed properly. Inferior fish oil supplements may cause more problems than they solve, and you'll be left with a supplement that is expensive and ineffective for your keto diet. Choose supplements that are sourced from sustainable areas and avoid using a supplement from farmed fish. While this may sound like an overwhelming set of criteria, it's essential you take the selection of your fish oil supplement seriously. The benefits will pay off in the form of better health, vitality, mental function and physical performance. Choose supplements that are not oxidized and that contain a balanced level of EPA and DHA. Select oils that are certified by reputable organizations. There are two essential fatty acids that a fish oil supplement must include. EPA and DHA are both omega-3 fatty acids that the body is unable to make on its own. If these aren't obtained from the diet, the body and general health suffer. Most people get plenty of omega-6 fatty acids but fail to get the right amount of omega-3 fatty acids. This can result in increased inflammation and a compromised immune system that invites sickness and disease. Luckily, a fish oil supplement offers an excellent way to ensure the body gets the right nutrients. EPA and DHA act as opposite sides of the same coin. Heart health can be improved through the addition of EPA. DHA plays a crucial role in the development of the brain, and it ensures proper cognitive functioning as well. Since inflammation can be a concern for some on a keto diet, these nutrients are vital to maintaining normal inflammation levels. At the most basic level, you must evaluate the total omega-3 levels in the supplement. Many manufacturers will attempt to mislead consumers by specifying the total amount of fish oil in the product and not the amount of omega-3 fatty acids. It's the omega-3 content that is valuable and necessary to realize benefits from the supplement. Pay attention to the serving size as well since many supplements require you to take anywhere from three to six pills for a single serving. It's important to avoid equating the cost of a particular brand of fish oil with quality. Most importantly, you can't trust the label provided by most manufacturers. Since supplement companies aren't held to strict standards, many supplements will have much less omega-3 content than advertised. On average, you'll get about one-quarter of the stated potency. In severe cases, you may end up with a supplement that contains up to 90 percent less omega-3 than advertised. Verify claims using independent lab companies that check the actual supplement levels of various manufacturers. ConsumerLabs and other laboratories offer testing services that you can trust. Dr. Weil recommends that you take a fish oil supplement that contains 700 to 1,000mg of EPA and 200 to 500mg of DHA. This offers a good balance between the two kinds of fatty acids. It's not necessary to take this supplement every day since the body can store the excess. Aim to take the supplement two to three times per week for the best benefit. The best option is to take it in a pill form to ensure that it doesn't cause stomach upset or other undesirable side effects. Use only molecularly distilled fish oils and select the supplement that gives you the nutrients in as few pills as possible. A supplement that requires you to ingest six pills is likely to be mostly filler. The National Center for Complementary and Integrative Health notes several health concerns with taking fish oil supplements. The organization starts by warning consumers to avoid substituting fish oil supplements for a visit to the doctor. Fish oil can affect blood clotting and interfere with certain medications so you should consult your doctor to ensure the medication is safe. People who have a shellfish allergy should not take fish oil since it can cause an adverse allergic reaction. While Omega-3 fatty acid supplements are generally considered safe to use, some people do suffer from side effects. The most common side effects include stomach problems, which can manifest in the form of indigestion, diarrhea or belching. These supplements may also increase bleeding in some individuals. Making a distinction between fish liver oils and fish oil is also important since they are not the same thing. Fish liver oils contain large amounts of vitamin A and vitamin D. While it's hard to overdose on vitamin D, vitamin A can be toxic at high doses. 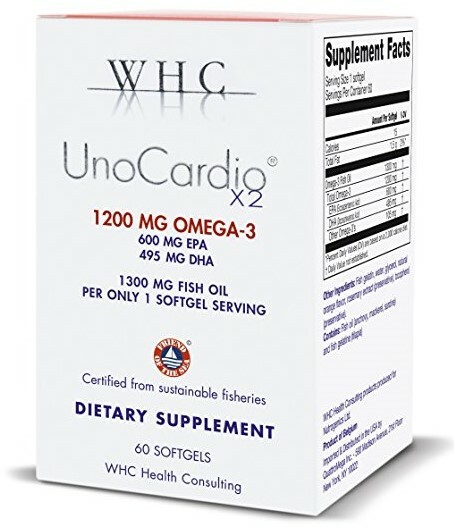 UnoCardio makes a variety of fish supplement options, but UnoCardio 1000 offers a premium-quality product with high efficacy and absorption rates. The product has been rated as highly effective with a label accuracy rating of 99 percent from the independent lab LabDoor, Inc. This agency regular tests supplement products, and this particular product gets high ratings across the board. The company uses cold-processing techniques to avoid damaging the valuable nutrients. Using environmentally-friendly techniques, the company only extracts fish oil from sardines and mackerel. These fish are not endangered and provide safe and clean omega-3 fatty acids. A single softgel contains 1185mg of omega-3 divided into 652mg of EPA and 440mg of DHA. Contains less than 4 parts per billion of mercury. Combined DHA and EPA levels account for 77 percent of the total fish oil in the supplement. This fish oil has the highest projected efficacy of our recommended products based on third-party testing. The product contains more than just fish oil, which may make creating a custom supplement regimen more difficult. Using a unique extraction method, this supplement goes beyond the molecularly distilled fish oil techniques that are generally regarded as the best method for extraction. The proprietary method uses supercritical extraction to ensure that the highest level of absorption and purity are maintained. It has slightly higher mercury levels than our top pick, but these levels are well below the standards recommended for food safety. Similar to the UnoCardio brand, this supplement also uses triglycerides for a highly potent delivery method. If it wasn't for the nominally elevated mercury levels, this supplement would likely top our list. Reportedly contains 2200mg of fish oil, which is broken down into 1400mg of EPA and 480mg of DHA. Uses a form of extraction that goes beyond molecularly distilled fish oil to give a pure and clean form of the oil. The EPA and DHA content account for 79 percent of the overall fish oil content. A single serving size is two capsules. Third-party testing shows a 97 percent accuracy rating for actual measurable fish oil content. UnoCardio X2 is a slightly watered down version of the UnoCardio 1000. It still has many of the same high ratings from the independent laboratory LabDoor, but it doesn't score quite as high in a few key areas. In terms of label accuracy, this product maintains an accuracy of 95 percent compared to the stated levels of omega-3 fatty acids. In the world of over-the-counter supplements, this supplement offers a high degree of accuracy. Like it's older sibling, this supplement uses a heat-free and ecologically friendly process to prevent nutrient losses. Contains the recommended amount of omega-3 fatty acids in a single pill. The smaller pill size is easier to swallow than our top two options in our list, but it does have a lower level of total omega-3 fatty acids. Uses fish gelatin instead of bovin gelatin for easier digestion. Tested to be less than 1.4 parts per billion of mercury. Contains a lower concentration of omega-3 fatty acids, but the dosage is still within the recommended range. Third-party testing shows an efficacy of 54 percent, which is typical of medium- to high-grade fish oil supplements. 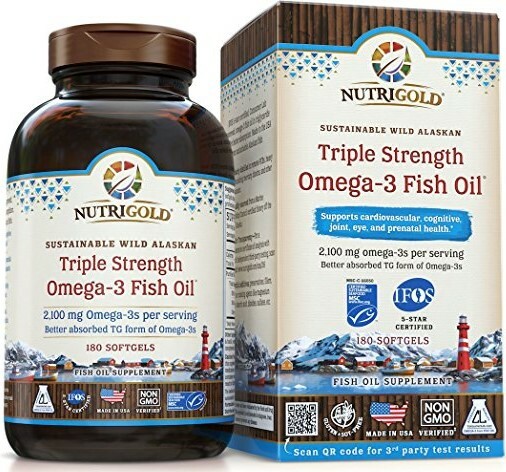 The good news is that this product has more than the recommended daily allotment of omega-3 fatty acids even though the labeling accuracy is only about 85 percent. However, since the claim is 2100mg of omega-3 fatty acids, you'll still get your daily allotment and save a bit of money off the higher-rated options. The supplement has low mercury levels, and you'll be able to get an estimated 900mg or EPA per serving and 240mg of DHA per serving when you account for the discrepancy between independent tests and the label. In terms of nutritional value, this supplement rates higher than most at 98 percent according to LabDoor, Inc. Affordable and high safety ratings with only 3 parts per billion of mercury. Contains 89 percent overall total fish oil content so you're getting most of what you pay for. The product is rated as both gluten-free and non-GMO for an excellent safety rating. Extraction uses the preferred molecular distillation method. Uses a bovin gelatin capsule, which is widely considered to offer a stunted delivery mechanism. The product is more likely to cause stomach upset due to the formulation. 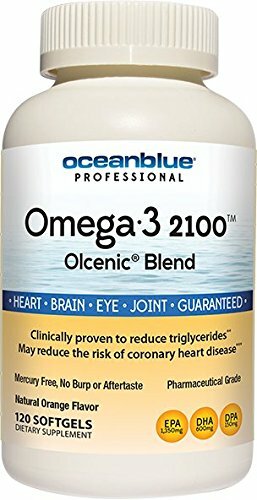 If you're not certain if fish oil is right for you, start with the Ocean Blue Professional supplement and see how you feel. It contains more than enough omega-3 fatty acids to achieve optimal health. The product also tests well with third-party labs. You'll enjoy low mercury levels with only 1 part per billion of mercury. You also get most of what you pay for with an estimated 74 percent of the total fish oil content promised on the front of the package. An affordable option for people who aren't certain of the benefits of fish oil. Tested to be one of the safer options available with a high nutritional value. Uses a citrus oil and scent to mask the aftertaste, but this is ideal for a first-time user who wants to avoid side effects. Softgel information isn't indicated on the bottle, and it simply refers to the capsules as gelatin. There is no mention of the source of the fish oil on the bottle, but the company website states that it may use Peruvian anchovies, Alaskan pollock or both. 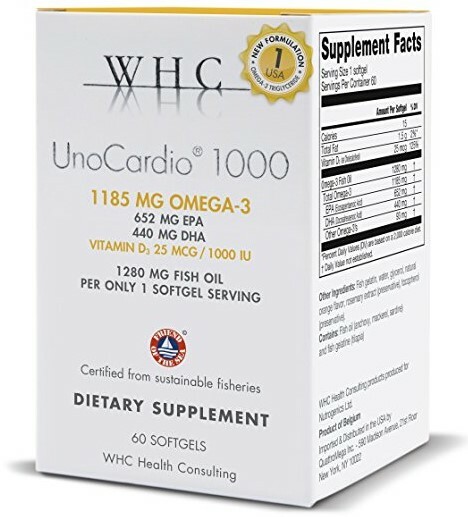 WHC UnoCardio 1000 provides the best option for getting the right levels of omega-3 fish oil without the harmful additives and toxic metals found in so many supplements. It's sustainably harvested so you can feel good about taking this supplement. It's also one of the highest rated options on the market. Using a molecular extraction method, you'll get a pure supplement and clean delivery thanks to the fish gelatin capsules.